Dana Group Dubai is a UAE based manufacturing company, which manufactures pipes, profiles, sandwich panels, purlins, cable trays, water heaters, coolers, chillers in UAE. Dana Group is expanding to Qatar with the help of a JV with Unique Qatar. 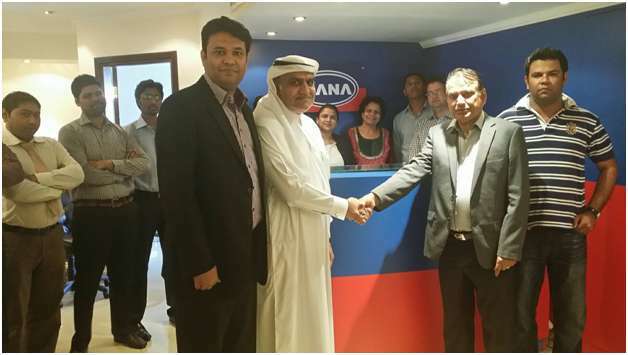 DUBAI, UAE - May 4, 2014 - PRLog -- Dana Group, a Dubai based multi-national corporation, has joined hands with Unique Trading Company, a premier Qatari establishment, to handle all its sales in Qatar. Prior to the deal, Dana Group had been catering to its clients in Qatar directly from its head office in Dubai. With the help of this joint venture with Unique Trading Company, Dana Group is planning to have strong hold in the Qatar market. The deal was part of Dana Group’s strategic planning for the region and the partnership commenced from Q2 this year. The agreement was signed on the 20th of April this year, when Unique Company Qatar’s Chairman Abdul Rahman Mohammed Al Muftah shook hands with Dana Group’s chairman Dr. Birbal Singh Dana in Dubai and inked the deal. Although the exact structure of the joint venture was not disclosed, Unique Qatar is expected to stock a variety of Dana Group’s products in its own warehouses in Qatar. These products include Dana water heaters, Dana water chillers, Dana water coolers, Dana cable management systems, Dana sandwich panels, Dana C&Z purlins, Dana fencing systems, Dana profiles, Dana corrugated and perforated sheets, and also Dana’s GI Stud Track systems. Apart from these products, which are manufactured by Dana Group in Dubai, Ajman, and Umm Al Quwain, Unique Qatar will also be the stockist for Dana Group's steel products in Qatar for the near future. These steel products include all assortments of “flat steel” products such as GI (Galvanized iron), PPGI (Pre-Painted GI), CR, HR, Aluminum, and Stainless Steel for the Qatar market. Dana Group is the largest flat steel supplier for these metals in the Middle East and North Africa market. Providing his motivations behind the deal, Dana Group’s chairman, Dr. B.S. Dana stated,“we have known Unique Qatar for over 12 years now and we have been dealing with them since 2004. We have built immense trust and respect for each other over the period of these years. We believe there could have been no stronger partner for us in Qatar than Unique Qatar”.